Bobby T. Jones (& O.B. Keeler.) DOWN THE FAIRWAY. 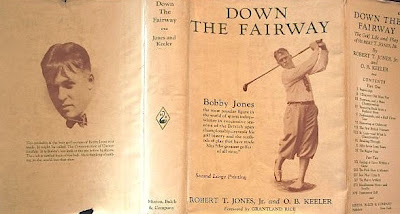 THE GOLF LIFE AND PLAY OF ROBERT T.JONES JNR. Minton & Balch, N. Y. 1927. It is said he never took a lesson and stored his clubs most winters, nevertheless he became the only individual ever to receive two New York City tickertape parades. At the 1925 U.S. Open in Worcester, Massachusetts, Jones's ball moved in the long grass on the steep bank by the eleventh green as he addressed it; he insisted, over official objections, on adding a penalty stroke to his score. When praised for his honesty, he retorted, "You might as well praise me for not breaking into banks. There is only one way to play this game." Because of this penalty he lost the game by one stroke. This incident is highlighted in 'The Legend of Bagger Vance' where the fallen hero Junah does the same thing in a play off with Jones and Hagen. This book, part of a mystical trend in golf writing, is based on the Bhagavad Gita with the caddy/ guru Bagger as Bhagavan/ Lord Krishna and Junah as Arjuna and the golf course the battlefield of Kurukshetra. Not to be outdone Deepak Chopra put out a golf book 'Golf for Enlightenment: The Seven Lessons for the Game of Life'- fine jacketed firsts can be still had for $4. 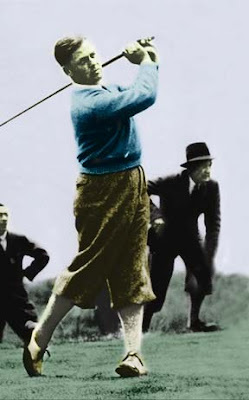 Jones was a hotheaded perfectionist who once, after missing an easy shot, took a full pitcher's windup and threw his ball into the woods, and another time chucked his putter (nicknamed "Calamity Jane") over the heads of the gallery and into the trees. The influence of O.B. "Pop" Keeler, an Atlanta sportswriter some call the first sports psychologist, helped settle him down. The older man became a mentor, friend, confidant, and publicist for Jones, traveling 150,000 miles with him and witnessing all 13 of his major championships. Keeler is the guiding hand in Jones's classic book. These days they might say 'as told to O.B. Keeler' but Jones was not some thick footballer, he had trained as a lawyer and studied English at Harvard and was an admirer of Cicero. Of the great Roman orator he wrote: "I remember also envying Cicero because he evidently thought so well of himself... If only I thought as much of my golfing ability as Cicero thought of his statesmanship, I might do better in these blamed tournaments." VALUE? The big money with this book is for the signed edition from Minton & Balch which was limited to 300 copies. It is signed by Jones and Keeler. It has made as much as $14000 in auction (2005) and there are several on ABE at above $10,000. A copy sold last month at auction at PBA for $9000 in a lacklustre sale. Apparently golf collecting (clubs, balls, memorabilia, books) is not what it used to be and may have peaked. Good books still make hefty prices but the glory days have faded for the moment. Observers of the scene are waiting for 'the finest golfiana sale in recent memory' - the sale of the collection of Jeffery B. Ellis in NY Septemer 27/ 28. If this makes good money ($4million +) things may revive. It seems that there are too many golf libraries appearing in auction as collectors die, need to raise money or lose interest. There may be too much Golfiana for the punters to absorb and it is possible that new collectors are not being created in sufficient numbers. STOP PRESS The Jeffery B. Ellis collection, mostly rare golf clubs, made a useful but not priapic $2.1 million including premium, about half what was expected with some biggish buy-ins. There don't appear to have been many books. By no means a tragedy bu a little below par. Ellis is the autor of the authoritative ' The Clubmaker's Art' and also something of a dealer in clubs. This may explain the sale's failure to ignite--collectors (and dealers) prefer to buy at the dispersal of private collections, preferably with the owner safely departed to that great golf links in the sky.